(MENAFN - EIN) One of 11 lots from Civil War archive of James Bolestridge of 23rd Regiment Pa. Volunteers and Birney’s Zouaves, shown in this ferrotype estimated at $4,000-$5,000. Archive includes letters with first-person accounting of Battle of Gettysburg. We're a boutique auction house and selective about what we sell. We strive to keep the number of auction items manageable. That way every piece has a chance to shine.— Chris Sammet, Co-owner, Milestone AuctionsWILLOUGHBY, OHIO, UNITED STATES, January 14, 2019 / EINPresswire.com / -- Some of the highest-quality firearms and most important historical relics ever to pass through Milestone Auctions' doors will be presented in a January 19 sale comprising more than 800 lots. Many of the items chosen for the suburban Cleveland company's first event of 2019 are fresh to the market from private collections. Bidders are warmly invited to attend in person at the gallery or to participate by phone, absentee or live via the Internet . The January 19 auction will open with modern-era firearms and conclude with antique weapons whose timeline starts with a 1680-1720 British .80 caliber dog-lock musket. Important militaria will be interspersed throughout, adding variety to the day's lineup. The Civil War section of the sale is led by two exceptional collections. One collection consists of a Civil War POW grouping from Lt. Josephus F Schuyler of the 123rd Ohio Voluntary Infantry. Schuyler was captured in 1863 and sent to Richmond's notorious Libby Prison. There he amassed an autograph book of fellow officers' signatures and photographic cartes de visite. Together with the ephemera, Schuyler retained many articles he carved of bone while incarcerated, from cutlery to rings to crochet hooks. Each is a work of art. This extensive set of Civil War mementos was sourced directly from one of Schuyler's descendants and is estimated at $15,000-$20,000. A second featured Civil War archive is so extensive that it has been apportioned into 11 consecutive lots. 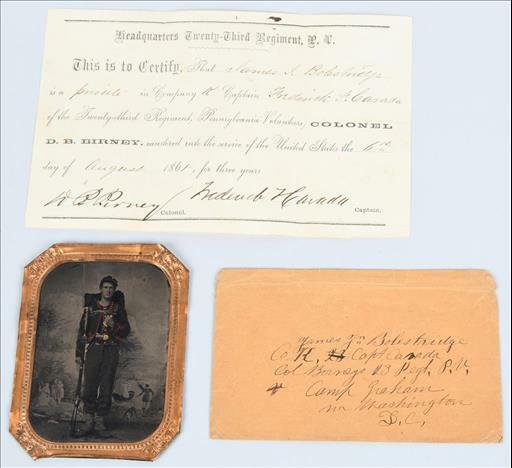 All of the items represented pertain to the Civil War service of James Bolestridge of the 23rd Regiment Pennsylvania Volunteers and, later, Birney's Zouave regiment. Within this extraordinary collection of historical keepsakes, which was retained by many successive generations of Bolestridge's family, are a ferrotype of the soldier in uniform at age 17, his enlistment papers, saber bayonet, medals, CDVs, diaries, and a riveting collection of 50 wartime letters. In one of them, Bolestridge describes the Battle of Gettysburg, writing: 'I have escaped unharmed during the last fight,' going on to note regimental casualties and the nature of wounds, some mortal. Bolestridge added: 'We gave the Rebels a terrible punishing on the 3rd of July and if it had not been so stormy on the 4th we would have peppered them again…' Chris Sammet expects the 11 lots to realize at least $25,000 cumulatively. Included among the earlier firearm highlights is a witness to America's westward expansion, a Winchester 1873 (patent) .44 caliber saddle ring carbine rifle. It was shipped from the Winchester warehouse in 1889 and has the rare distinction of having been a traveling salesman's sample. 'This is confirmed by the notation within its matching Winchester letter (included in auction lot) that says 'Consigned,' Sammet explained. In excellent condition, its auction goal is $15,000-$20,000. Within the 20th-century firearms category, a desirable 1936 Krieghoff Suhl semi-automatic Luger pistol ranks very highly. Dated and bearing Krieghoff proof marks, the near-mint example from the World War II era is expected to make $6,000-$8,000. A rare 1939 German SA presentation dagger with a Damascus blade by E.F. Horster is engraved on the obverse in high-relief gold: 'Alles fur Deutschland' (All for Germany). The rare Nazi piece came out of the collection of WWII veteran Master Sgt. Dominick J. DeMaggio, who was an interrogator and interpreter of Italian POWs. With fitted box, the historical dagger is estimated at $15,000-$20,000. One of the highest-estimated lots in the sale is a WWII Luftwaffe gold 'Double Badge' with 150 brilliant-cut diamonds. Regarded as one of the most sumptuous awards of the Third Reich, such brooches were created to a very high standard, under instruction of high-ranking Nazi leader Hermann Goring, who awarded them to favored Luftwaffe members and important Third Reich figures of allied states. Accompanied by a Detlev Niemann COA, the example to be auctioned is estimated at $70,000-$80,000. Made in 1990, a featured Colt .45 single-action army revolver is a cutaway special edition that comes with a printed Colt historian letter, original box and papers. The letter notes that the term 'cutaway' refers to the left stock, which has been designed to allow for viewing of the internal mechanism. Only 100 units of this special model were produced, and the one being auctioned is one of only seven made in its particular configuration. In crisp, mint condition, it carries a $5,000-$7,000 estimate. For the antique gun collector who is a 'completist,' a Smith & Wesson Model 320 revolving rifle originally shipped on May 29, 1894 would fit the bill nicely. Not only is it one of the most sought after of all Smith & Wesson guns, it also comes housed in a custom French-fit wood case with a box of scarce Smith & Wesson .320 cartridges, and a detailed S & W factory letter. Its auction expectation is $8,000-$12,000.